The facility enclosures are equipped with state-of-the-art, java-based, web-cameras with 26x optical zoom. 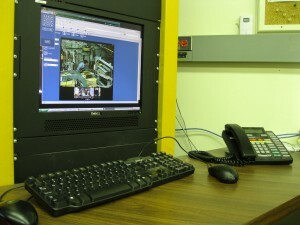 Users can see into the enclosure and monitor their apparatus even when the beam is running. These cameras can be accessed from onsite or via the Virtual Private Network (VPN) when not onsite. – Section 2, above 2C hut. – Section 2, above 2A area. – Section 1, inside 1B hut. – Section 1, inside 1A hut. – Section 2, inside 2C hut. A digital camera is also available to users from the FTBF coordinator to take pictures of an experiment, set-up or collaborators. FTBF management encourages pictures. With the experiment’s permission, pictures may be posted on the FTBF website.